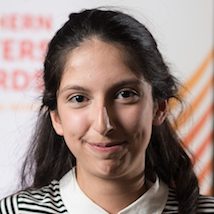 Zainab lives in Sheffield where she is in the process of finishing off her GCSEs. In 2014 she won the Wicked Young Writer’s Award in 2014 in the 15-17 category and came second in Writing Yorkshire’s ‘Photofictions’ competition. In 2015 she was one of the winners of the Falmouth University Young Writers’ Prize and, as a result, was published in the university’s literary magazine WiTH. Zainab writes stories, but also dabbles in poetry. She describes herself as ‘passionate about music, films, books, the universe, pacifism and gender equality’.